The AlphaGage+ is a key asset for inspectors, maintenance operators and QA technicians looking to measure essentially any engineering material thickness as it combines years of ultrasonic R&D into an extremely rugged and perfectly ergonomic hand held enclosure. The AlphaGage+ is a very versatile piece of equipment, capable of performing integrity assessments of metal steel works affected by corrosion or erosion processes as well as to measure precisely the thickness of a critical piece of equipment. All versions of the AlphaGage+ are supplied with a number of accessories including plastic carrying case, AC power adaptor, USB cable and certificate of calibration. Dependent on the version, the AlphaGage+ is also supplied with a suitable transducer for performing either Precision thickness measurements or for Corrosion measurements. The AlphaGage+ is can be used as either/both a precision thickness gauge and/or a corrosion thickness gauge. The AlphaGage+ is also upgradable in the field - A flexible solution as it can be fully loaded from the start or upgraded anytime later by easily activating its valuable software options when required. Precision gauges are particularly effective when using single element transducers and delay line wedges in Pulse-Echo configuration to achieve higher accuracy than corrosion gauges and meet very strict quality control requirements. Standard features include a wide thickness range (up to 20” in steel), a 1 micron resolution (0.0001” or 0.001 mm), store and recall up to 2,700 setups, a high end 30 MHz bandwidth instrument and a “Zoom Auto Tracking” functionality. One DLK1025 transducer - 10 MHz, 0.25" diameter with Lemo to Microdot cable 6"
Without being limited to, the corrosion gauges generally use dual element transducers in a Pitch & Catch configuration to reduce surface problems and measure accurately the remaining wall thickness of metal structures subject to corrosion. Standard features include a wide thickness range (up to 23” in steel), coating thickness and substrate thickness displayed simultaneously on gauge with live waveform, temperature correction and file compare features for data logger versions. With internal SD card memory of up to 32GB, store without limit thickness readings with ID location for corrosion mapping or profile assessment and send readings to Microsoft ExcelTM (DataXLS) for further asset maintenance evaluation. 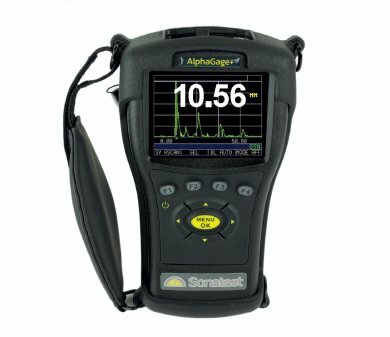 AlphaGage+ C - High performance hand-held CORROSION thickness gauge. AlphaGage+ P - High performance hand-held PRECISION thickness gauge. AlphaGage+ CP - High performance hand-held CORROSION & PRECISION combined thickness gauge. ​For example the AlphaGage+ C is suitable as just a reliable corrosion gauge. While a AlphaGage+ CPDLW is a dual purpose corrosion and precision thickness gauge with A-Scan and B-Scan functionality. Alarms According to alarm conditions, the gauge can vibrate (ideal for loud environments), beep or change the colour of the main display. UI Languages English, French, German, Spanish, Italian, Russian, Czech, Finnish, Chinese, Japanese, Hungarian.